Do you have the need for regularly updated images of locations around the world? Perhaps you need imagery to integrate with an OEM solution you are developing? Or maybe your organization uses large amounts of high-resolution imagery each year, and you are seeking a low-cost option for this data? 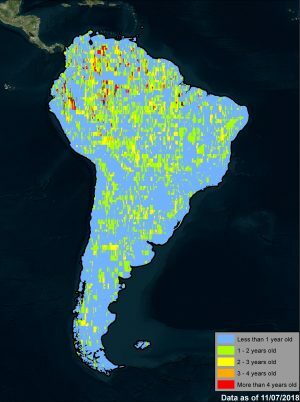 The available DigitalGlobe EarthWatch imagery over South America by location and with the most recent coverage date indicated with varying colors. In the vast majority of locations, there are multiple imagery dates available. If you answered yes to any or all of these questions, then the solution you are looking for is DigitalGlobe’s EarthWatch (formerly called Global Basemap or GBM). With EarthWatch, you have access to millions of square kilometers of imagery with low cloud-cover and off-nadir angles. This data is accessible in streaming web-mapping services as well as through an online viewer. And perhaps the most important feature of EarthWatch is the regular updates you can receive as out-dated imagery is often of little or no use to our valued clients. For more information on the pricing and coverage available in DigitalGlobe’s EarthWatch, you can reach our sales team anytime at sales@apollomapping.com or during typical business hours at (303) 993-3863. This entry was posted in The Geospatial Times and tagged DigitalGlobe, DigitalGlobe EarthWatch, EarthWatch, product updates, South America, The Geospatial Times by Apollo Mapping. Bookmark the permalink.